Take a peek at what’s in season at four Massachusetts farms, and try out recipes packed with summer flavor. Lead farmers Steph Moran (left) and Will Morningstar with a tiny portion of the bountiful zucchini crop from the fields at Allandale Farm. This historic urban farm and nursery supplies restaurants like Cambridge’s Harvest, Jamaica Plain’s Vee Vee, and Newton’s Sycamore. Today, the farm — about a quarter of which lies in Boston — is a haven for city slickers who want a taste of country life. It has a farm stand, garden center, and an outdoor summer program for pint-size patrons. It also produces everything from heirloom and cherry tomatoes to hot and sweet peppers, cucumbers, carrots, and melons, cultivated on 20 acres by lead farmers Will Morningstar and Steph Moran. Zucchini is a particular hit with customers and with chefs like Sycamore’s Lydia Reichert, who uses it to make a refreshing chilled summer soup with basil (see recipe) at her restaurant. “The ideal zucchini should be about eight inches, firm but tender, and green. It’s sometimes speckled — but never streaky,” says Glotzer. Bring a large pot of water to a boil over high heat. Fill a large bowl with ice water. Working in batches, plunge the basil into the boiling water, then immediately transfer it to the bowl of ice water to stop the cooking. Drain well. In a stockpot, Dutch oven, or other large pot, heat the oil over medium-low heat and sweat the onions, garlic, thyme, and 1 teaspoon salt until tender. Do not let the onions and garlic turn color. Add the zucchini to the pot, add cold water to cover, and turn up the heat. By the time the mixture reaches a simmer, the zucchini will be tender. Turn off the heat. Working in batches, puree the mixture and drained basil in a blender, or add the basil to the stockpot and use an immersion blender to puree until very smooth. Place a bowl large enough to hold the entire mixture into a larger bowl half filled with ice. Using a fine-mesh strainer — or a chinois, if you have one — strain the mixture into the top bowl. Use a rubber spatula to press down on the puree and scrape off the outside of the strainer. Add the cream, stir to mix thoroughly and chill, season with salt to taste, and serve in chilled bowls. 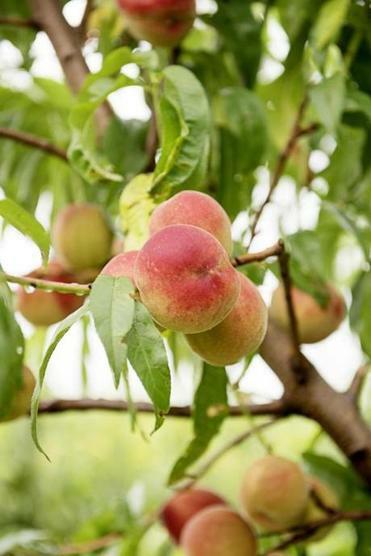 Jim Ward of Ward’s Berry Farm is a fan of peaches fresh from the tree. Ward (second from left) with employees at farm. In 1981, Jim Ward’s parents bought land in Sharon and planned to retire there. So much for relaxing: His father, a former engineer, decided to plant 7,000 blueberry bushes and began selling the crop. Eventually, Jim and his brother Bob took over the business and expanded it to include corn, tomatoes, berries, peaches, plums, pumpkins, and more on 200 acres. Today, the farm employs 70 people, including a half-dozen or so full-time workers who arrive at 5 a.m. or earlier during the summer. It’s not uncommon for Ward to put in summer days from 3 a.m. to 7 p.m. The business has also grown to include a retail store that sells house-made sandwiches, baked goods, and prepared meals. “People go crazy for our chicken Parm,” Ward says. Chefs, meanwhile, go crazy for his produce. 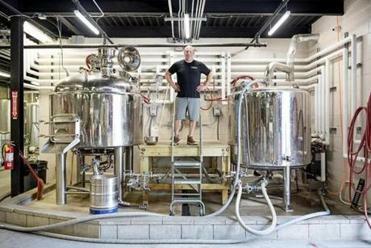 He supplies larger restaurant distributors as well as restaurants like Brookline’s La Morra and Boston’s Townsman, where chef-owner Matthew Jennings accompanies grilled flatbread and shaved ham with Ward’s peaches. Right now, those peaches are in season, and Ward loves them. “The peach is picked right from the tree. It’s unlike a peach that you buy in a store. It’s way juicier. I always think a peach should be eaten in private, because it runs down your arm,” he says with a laugh. Peaches from Ward’s Berry Farm in Sharon. Place 1/3 cup warm water, the yeast, and the sugar in a bowl and let sit for a few minutes to soften and bloom the yeast. Add the oil and salt. Using a wooden spoon or a mixer with a dough hook, mix in the flours. When the dough forms a ball, turn out onto the counter and knead for several minutes. (If the mixture does not come together, add 1 teaspoon water at a time.) The dough is ready when it is somewhat stiff, smooth, and supple. Coat the dough with oil and let rise for 1 to 2 hours (longer if you used active yeast, instead of instant) in a covered container at room temperature. Dough will expand to about 1½ times its original size. Refrigerate until ready to use. Alternatively, you can skip rising it on the counter and just place it in refrigerator overnight. Combine the basil, garlic, and toasted almonds in a food processor and pulse until coarsely chopped. Add ½ cup oil and process until fully incorporated and smooth. Season with salt and black pepper, add the remaining oil, and pulse until smooth. Transfer the mixture to a large serving bowl and stir in the cheese. Set aside. In a small bowl, gently toss the peach halves with the oil, salt, black pepper, honey, and lemon juice. Place peaches cut side down on the hottest area of the grill. Sear them, rotating ¼ turn every 2 minutes, until they develop nice char and marks from the grill on one side. After 6-7 minutes, turn them over and set them on a cutting board to cool. Once cool, slice each half peach into thirds with a very sharp knife. Set the peaches aside and leave the grill on (you’ll need it to prepare the flatbreads). Remove the flatbread dough from the refrigerator and cut it into 6 even pieces, about 4 to 6 ounces each. Using a scale is best, although you can eyeball it with good results. On a lightly floured surface, roll out each dough ball into an elongated flatbread roughly 3 to 4 inches wide and approximately 10 to 12 inches long. Dust each with flour and stack, separated by pieces of parchment paper. With the grill still hot, lightly oil the flatbreads with a pastry brush and place them on the hot area of the grill. They will puff up and may smoke; this is OK! As the flatbreads cook, move them around the grill so that they don’t burn, but let them get a nice little char. Cook through, about 2 or 3 minutes per flatbread, per side. Move the flatbreads to the cooler section of the grill and spoon about 1 tablespoon of the basil and almond topping onto each one. Scatter the peaches and jamon serrano over the topping, then sprinkle on the grated Manchego. Close the lid of the grill, turn the heat off, and let the cheese melt over the flatbreads. When melted, remove the flatbreads from the grill very carefully, place on a cutting board, and garnish with the basil leaves, the almonds, and a drizzle of the oil. Serve immediately. 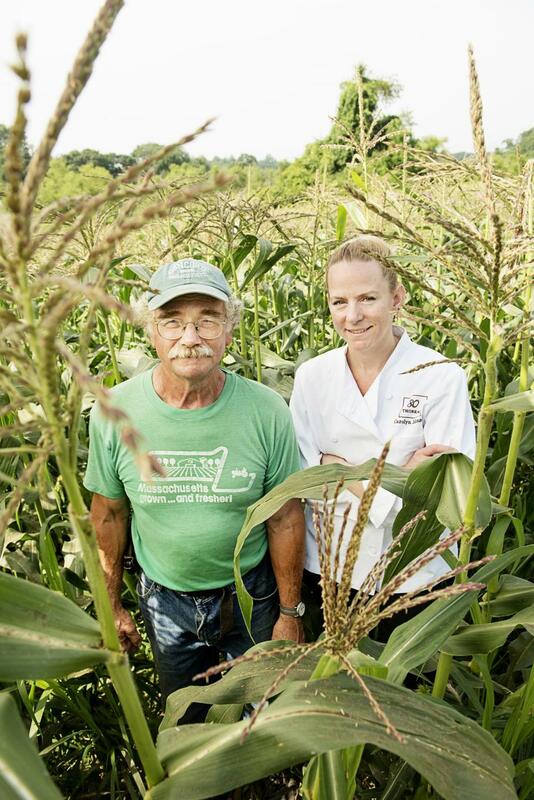 Charles “Chip” Poutasse of Brigham Farm Stand and Carolyn Johnson of 80 Thoreau, surrounded by sweet corn. Concord-area residents and commuters who long for sweet corn know to head straight to Brigham Farm Stand. Charles “Chip” Poutasse runs the business with his half-sister, fifth-generation farmer Jane Brigham Bailey. He and his family — including his 99-year-old mother — live on the property. Chef Carolyn Johnson from Concord’s 80 Thoreau, just down the street, is the farm’s only restaurant customer. She offers a special corn and tomato menu at the end of August (see recipe). The farm stand also sells cucumbers, raspberries, tomatoes, zucchini, and more from nearby Macone Farm, which lacks a retail operation. Another attraction? The farm’s vintage tractors from the 1950s and 1960s, a favorite of visiting kids. Prepare a hot fire in a charcoal or gas grill. Meanwhile, preheat the oven to 400 degrees. Spread the corn bread on a sheet pan and drizzle with ¼ cup oil. Toast in the oven for 8 to 10 minutes, until dark golden on the edges. Let cool completely. Season the onion slices with 1 tablespoon oil and salt and black pepper to taste. Grill over medium heat until charred and tender. Let cool briefly, then chop. Season the corn with 1 tablespoon oil, coriander, salt, and black pepper. Grill over medium heat until lightly charred. Let cool and slice kernels off the cobs. Transfer the corn bread to a large bowl. Add the grilled onions, corn, roasted red and poblano peppers, tomatoes, parsley and/or cilantro, and scallions. Season liberally with salt and black pepper. Drizzle vinaigrette (see recipe below) over everything and gently toss to combine. Serve on its own or use as a topping for grilled beef, chicken, or pork. Whisk the vinegar, shallot, mustard, salt, and pepper together in a bowl. Slowly whisk in the oil to emulsify. Makes enough corn bread to cut into 8 cups of 1-inch cubes. From Carolyn Johnson, 80 Thoreau, Concord Carolyn Johnson uses cornmeal from Four Star Farms in Northfield in this recipe. Preheat the oven to 425 degrees. Place a 9-inch baking dish or cast-iron pan on the middle rack to preheat. Saute the onion and jalapeno in 1 tablespoon butter over medium heat until light golden. Increase the heat to high and add the corn. Season with salt and black pepper to taste and saute for 1 minute. Add the thyme and set aside to cool. Combine the cornmeal, flour, baking powder and soda, brown sugar, and salt in a large bowl. Whisk the eggs and buttermilk together in a separate bowl with the ¼ cup melted butter. Pour the wet ingredients into the dry and stir to just combine. Gently fold in the reserved corn mixture. Remove the hot pan from the oven and swirl the remaining 1 tablespoon butter in it before pouring in the batter. Bake 20 to 25 minutes, until corn bread is golden and a toothpick comes out clean. 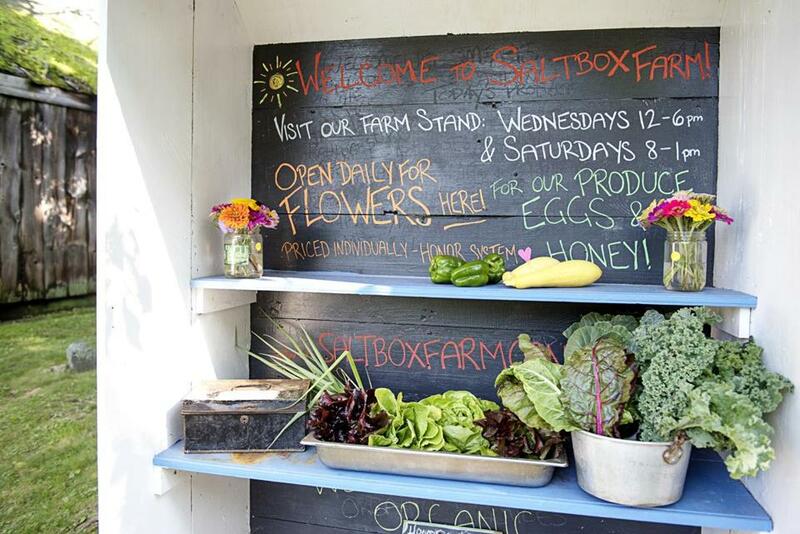 The Saltbox Farm property also has a small farm stand. Chef and farmer Ben Elliott’s mom grew up at Concord’s Saltbox Farm, which his grandparents started in the 1940s. As a child, Elliott often visited the property and learned how to work the land. He also learned how to cook with farm-fresh ingredients. Elliott went on to cook under chefs including Barbara Lynch, but he grew tired of the 14-hour workdays at restaurants like No. 9 Park and longed to be out on his own. In 2010, he returned to a quieter life in Concord, where he lives with his wife and their two children. 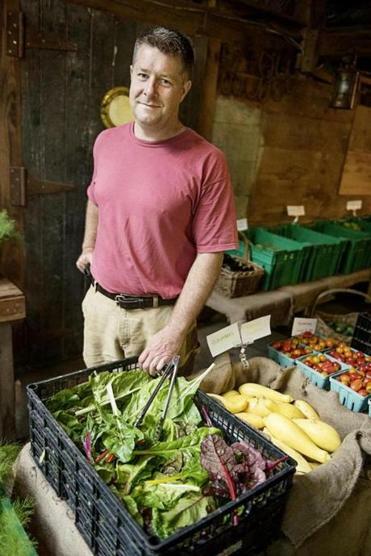 In 2015, he launched Saltbox Kitchen, in nearby West Concord. The restaurant and brewery showcases the farm’s wares, including a summer tomato and fresh bean salad (see recipe). Today, Elliott cultivates several kinds of tomatoes, summer squash, and eggplant, as well as many other vegetables, and raises sheep, chickens, and bees. He also maintains apple, peach, and pear trees with the help of farm manager Mark Congdon, and he hosts farm-to-table dinners on the 10-acre property. The life of a country squire suits him. Saltbox Farm owner Ben Elliott. In a large bowl, combine the tomatoes, wax and green beans, and herbs. Set aside. Whisk to combine the shallot, mustard, honey, red wine vinegar, and salt and pepper to taste. Slowly drizzle in the oil to emulsify. Adjust seasoning with salt and pepper. Add ¼ cup dressing to the vegetables and toss to coat. Reserve remainder of dressing (it will keep in the refrigerator for up to 1 week). Spread ¼ cup ricotta across each of 6 plates. Divide salad evenly among plates. Garnish with remaining fresh herbs, Parmesan, and crostini, and serve. 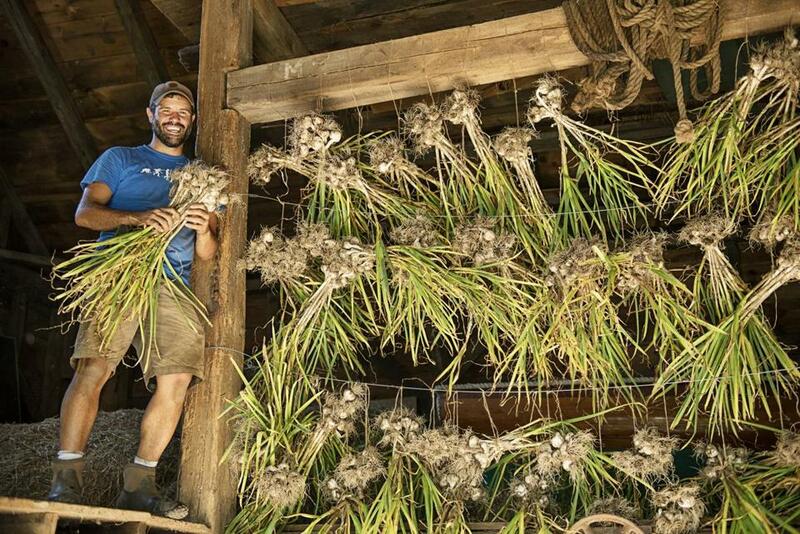 Saltbox Farm manager Mark Congdon holds garlic, which helps make Saltbox Kitchen a literal farm-to-table restaurant. Kara Baskin is a frequent contributor to the Globe Magazine. Send comments to magazine@globe.com. Follow us on Twitter @BostonGlobeMag.